– As was stated earlier, it is a requirement that a Certificate of Eligibility is obtained by the borrower which will ensure an honorable discharge and access to VA Loans. – There is not a minimum credit score required for VA Loans, however, this is where you will definitely run into lender overlays depending on the lender you choose to go with. From experience, here at Loan Consultants we will lend to the lowest FICO scores around which is 580 when other lenders are requiring 620 and 640 FICO scores for loan approval. – There is also not a defined debt-to-income ratio that needs to be followed and each loan should be evaluated on a case by case basis to ensure the proposed borrower will be able to make the mortgage payment on a monthly basis. – If you have outstanding collections whether they are medical or non-medical or if you have charge-off accounts, there is not a requirement to pay these off in order to get VA Loan approval. – Debt-to-Income Ratio: VA does not require a debt to income ratio and neither do we and we have gotten loans closed with DTI ratios approaching and surpassing 60%! This is a lot higher than most lenders who want to see a DTI ratio of 45% or less. – Collection Accounts and Charge-Off Accounts: A lot of lenders will require you to pay off all collection accounts no matter if they are for medical or non-medical issues. If you work with us, we will not require you to pay these off and we will insist you keep that money in your bank account than with a creditor. As you can see, there are some of the common lender overlays that you can possibly run into when working with lenders to obtain a mortgage. 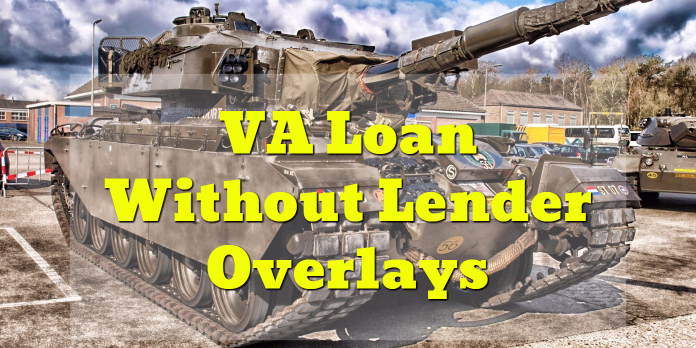 Now if you are looking for a VA Loan Without Lender Overlays or any VA Loan in general, you need to reach out to us today as we can ensure that we can work with all types of borrowers and their specific scenarios. We will work directly with you to develop a plan to get you in the VA Loan you worked hard to obtain access to. There is no reason you should go through the struggle of other lenders and jump through hoops in order to get your loan done. If you have done your research and are familiar with the minimum requirements needed for a VA Loan, then we should have no problem taking care of you and getting your deal done! Aside from no lender overlays, while working with Loan Consultants we will do everything we can to get your loan closed in 21 days where the industry standard is well over 30 days. We pride ourselves on closing loans as quickly as possible so we can get you in the new home sooner than later. If all this sounds good to you, then you need to reach out immediately and we can get you started on the path to home ownership in no time. As we talked about, VA Loans have the lowest mortgage rates of all loan programs out there and given your service to this country, you deserve nothing but the best. I look forward to working with you and delivering on my statements made in this article. Please call me any time day, nights, weekends, and holidays at 888-900-1020 and let’s get started today!